In September 2015, a landscape-level, science-based conservation effort developed through the collaborative work of 11 states, four federal agencies, multiple companies, and thousands of private landowners prevented the greater sage-grouse from being added to the list of threatened or endangered species. Unfortunately, the Trump administration is methodically dismantling this collaborative effort in ways that could imperil the species. Over the past two years, President Donald Trump’s Department of the Interior has initiated a number of actions that have not only undermined the landmark conservation strategy but that could also put the bird on a potential path to extinction. From rewriting land management plans to leasing oil and gas development in key sage-grouse habitat areas, the Trump administration is putting the remaining sage-grouse population in jeopardy and is threatening hundreds of other species—such as pronghorn, elk, and mule deer—that rely on healthy sagebrush habitat. Here are five Trump administration actions that could undermine this successful effort to protect the greater sage-grouse and conserve its imperiled sagebrush habitat. The U.S. Bureau of Land Management (BLM) recently released new plans to govern how public lands are managed in sage-grouse habitat across the West. Rather than uphold the rangewide conservation strategy, the new plans have been revised to defer to each state’s varying policies and resource management priorities—with the exception of Montana and Oregon, which requested no changes in the plans governing sage-grouse conservation in their states. The administration’s justification is that it is correcting what it characterizes as a “one-size-fits-all” strategy. Yet the result is a set of inconsistent standards and management directives that ignore the fact that sage-grouse move freely across state boundaries and that their habitat needs do not vary with the politics of the state they inhabit. Without some sort of cross-boundary measures to assure conservation of essential sage-grouse habitat across the species’ remaining range, this approach is likely to put the grouse at risk. In an alarming departure from the successful conservation strategy put in place in 2015, the Interior Department is aggressively moving to sell oil and gas leases in some of the best remaining sage-grouse habitat areas. For example, in March, the Trump administration leased 10 parcels covering 23,000 acres of public land in prime sage-grouse habitat in Wyoming—an area known as the “Golden Triangle” and deemed “the best of the best in terms of bird density” by recently retired Wyoming sage-grouse biologist Tom Christiansen. While an official from the Wyoming Petroleum Association asserted that in Wyoming, “development doesn’t occur where the activity is proven to harm the bird,” the rules in the area of this lease sale simply require that oil and gas development occur 0.6 miles from sage-grouse leks, or mating areas—much closer than the two-mile minimum buffer distance recommended by the U.S. Geological Survey (USGS) in its review of the impacts of disturbance on sage-grouse. Meanwhile, the Center for Western Priorities notes that the Wyoming BLM is evaluating 160 oil and gas lease parcels for auction in June 2019. The decision to move forward with leases in highly valued sage-grouse habitat is puzzling given that prior research has made clear that nationally, nearly four-fifths of the best oil and gas lands do not conflict with sage-grouse habitat. According to the study, even in oil-rich Wyoming, 71 percent of the areas with the highest potential for oil and gas are outside priority habitat areas. The U.S. Interior Department has also eliminated most sagebrush focal areas, about 9 million acres that the U.S. Fish and Wildlife Service (FWS) identified as “areas where it is most important that BLM and Forest Service institutionalize the highest degree of protection to help promote persistence of the species.” Delineation and protection of these strongholds from future development—including hard-rock mining—was an essential part of the conservation strategy. Yet the Interior Department has instead halted withdrawal of this land for mining claims and will permit future mining and oil and gas development in these key habitat areas. Interior Deputy Secretary David Bernhardt reversed an Obama-era department policy that required developers to compensate the public for any impacts to BLM lands and resources that were due to development. Bernhardt eliminated the requirement—known as compensatory mitigation—because it was considered “burdensome” to oil and gas development. 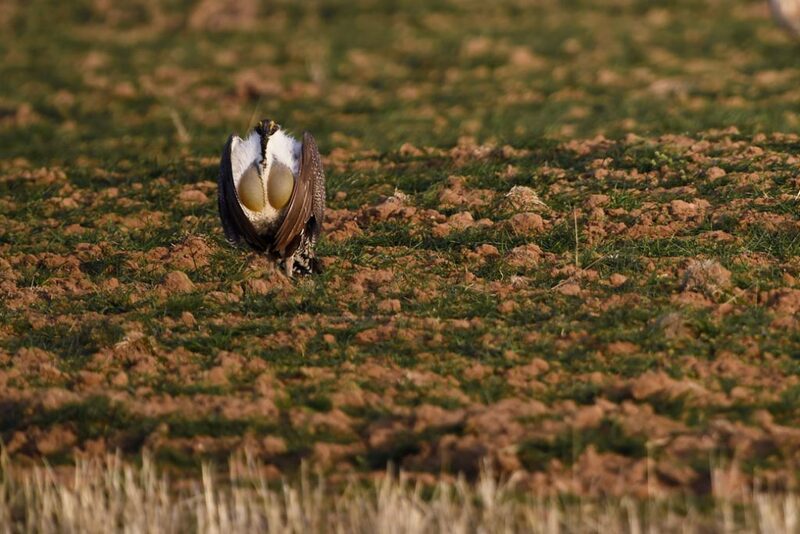 The decision to obviate any requirement for compensatory mitigation on public lands will have serious impacts on efforts to maintain and restore habitat for the grouse. The greatest threat to sage-grouse in the western portion of their remaining habitat is rangeland fire. In 2018, more than 2 million acres of sage-grouse habitat burned, including one million acres in Nevada alone. The Obama-era sage-grouse conservation strategy included a comprehensive rangeland fire strategy to protect sagebrush habitats as well as ranching communities dependent on the sagebrush ecosystem. The strategy placed a high priority on addressing rangeland fire by positioning firefighting equipment in places of high rangeland fire risk, ensuring greater coordination among firefighting agencies, supporting rural firefighting efforts, and restoring burned-over sagebrush lands with native seed to prevent the spread of invasive plant species such as cheatgrass, which can exacerbate rangeland fire risk. President Trump issued an executive order calling for “active management” to reduce wildfire risk, but the order is likely to shift resources from fighting rangeland fires to fighting forest fires and increasing timber sales. Should the Trump administration fail to continue to aggressively address rangeland fire and invest in measures to restore burned areas with native sagebrush vegetation, sagebrush habitat loss will further increase as cheatgrass invades burned landscapes, thus increasing the risk that future rangeland fires accelerate the decline of the sage-grouse population. In order to assess the effectiveness of the 2015 sage-grouse conservation strategy, the FWS was slated to conduct a “status review” of the sage-grouse conservation strategy in 2020—five years after the strategy’s adoption. However, at an annual meeting of federal and state fish and wildlife agencies and partners in March, FWS and state officials made clear that the U.S. Fish and Wildlife Service had been directed not to undertake the assessment. * As a result, tracking the effectiveness of the sage-grouse conservation strategy will fall to the states. Without a timely, coordinated, and collaborative evaluation of the strategy by federal and state scientists and biologists, the accuracy of the data collected and the effectiveness of the sage-grouse conservation strategy will remain in doubt. Through various directives, policy changes, and management measures, the Trump administration is refocusing the management of America’s public lands in ways that are already having significant impacts on the sage-grouse conservation strategy. If the administration continues down this path, it stands to reason that the FWS could reverse its 2015 decision—which determined that the comprehensive, collaborative conservation efforts included in the Obama-era sage-grouse conservation strategy were sufficient to prevent the greater sage-grouse from needing protection under the Endangered Species Act (ESA). Should the Trump administration’s changes to the 2015 conservation strategy lead the FWS to reverse its previous determination and decide that the bird should be listed under the ESA, significant pressure is likely to build in the West to weaken or undermine the bedrock conservation law. The Trump administration has set its sights on crippling this safety net for endangered species. In the end, its actions could help the administration achieve two of its apparent goals: more access to public lands for the extractive industries and changes in the ESA itself. Jim Lyons is a senior fellow at the Center for American Progress. *Author’s note: The author attended this meeting and personally heard federal and state employees discuss the directive that FWS not conduct the planned 2020 status review of the 2015 sage-grouse conservation plan. He subsequently confirmed this information with another current employee at the Interior Department.